I'm a rainbow collector. I've been collecting them all the way around the world. 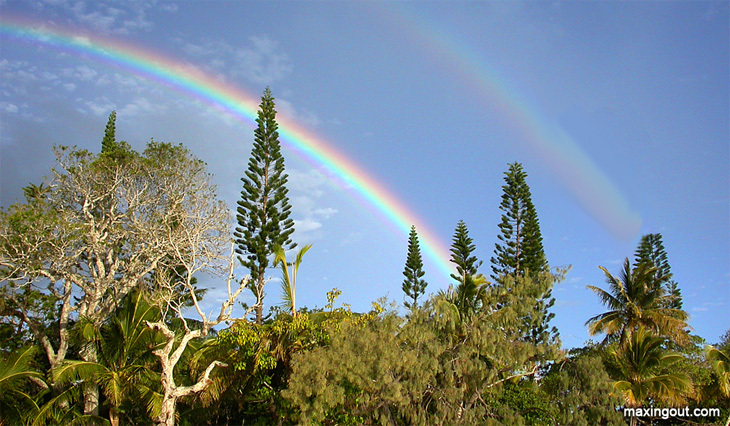 This particular rainbow came from the Isle of Pines in the South Pacific. This rainbow is from Singapore. In rainy season, hardly a day passes without a couple of rainbows making their appearance. This rainbow is from Mooloolaba, Australia. From our berth at Lawrie's Marina, we can see an awesome rainbow mirrored in the water. This rainbow is from Bequia in the Caribbean. Bequia is a rainbow machine, and you can see outstanding ones in Admiralty bay nearly every day. This rainbow photo from New Caledonia reminds me that there is no limit to how good my life can become. If you would like to see the best rainbows in my collection, you can visit them at another of my web sites: www.godlovesu.com.